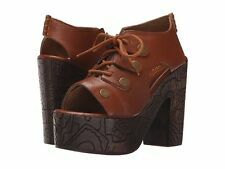 Lucky Brand Parisa Heels Women's Size: US 9 Color: Saddle Brown Condition: Excellent condition. Minimal signs of wear. MSRP: $99 The Parissa is a gorgeous clog style sandal with a classic feel. Features a wide stacked heel, lovely stitched details, and an adjustable strap/buckle at the vamp. Heel Height: 4" Fit: True to Size PayPal only please and please contact for international shipping. I will ship as soon as payment is received. I ship fast!! Please feel free to email me with any questions or special requests! Thanks for looking and happy shopping! These beautiful pair of shoes are perfect for any casual occasion, also for those that would like a little extra flare to there attire. Unionbay Suede Chuncky Heeled Clog Size 8. Although I listed these as used I have never worn them which is obvious by the pictures. They are super cute and can be worn with anything. The brass head studs blend in with the color. The little tassels on the sides are nice and look like they could be removed if you wanted to. The wooden look heel complaints the suede although these are extremely light. The soles non slip which is a great feature. CONDITION: Pre-owned with original box. Has light surface scratches, marks & minor dirt/wear on insides and bottom soles. Any issues will be noted or photographed. New (without box) Cape Clogs Swedish Shoes Women's US Size 9, European Size 40. Candy Apple Red with white polka dots. Heel measures approximately 3". Shipped with USPS Priority Mail. Part of the Børn Crown Collection. Wrapped heel. Dansko leopard (calf hair) clogs, size EUR 39, US 8 - 8.5. WIFE have too many PURSES and SHOES so SHE cutting back on how many SHE have. HER loss MY gain (SPACE ). Material : LEATHER AND PATENT LEATHER. White House Black Market. SEE PICTURES FOR MORE DETAILS. 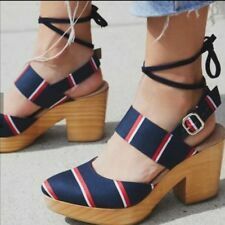 TOMMY HILFIGER AUTHENTIC WOMEN'S SUPER CUTE CLOGS/HEELS/MULES STYLE: TWSAYNA NAVY BLUE SOFT SUEDE GOLD PIPING TRIM GOLD TOMMY HILFIGER LOGO ON HERL SLIP ON STYLE PEEP TOE SIZE 8.5M EXCELLENT PREOWNED CONDITION! VERY CLEAN! NO ODORS! PRETTY!!! Swedish Hasbeens Toffel Peep Toe Super High Clogs In Black Size 36. Good used condition, there is not rips or scuffs on the heels, or leather. Heels, soles and leather is intact, the label on the insole fell off. Fits true to size Size: 6 retail price 239 Shipped with USPS Priority Mail. Dansko Animal Print Heel Clogs. I thought it was wear on fur around edge, but on closer look, I think it is just the way it is cut?. CONDITION: Pre-owned with original box. Has light surface scratches & minor dirt/wear on bottom soles. Any issues will be noted or photographed. Model: Tabia. Donald J Pliner Couture clogs. Made in Italy. Size: US 8.5, EU 39. Platform: 1.25". Rachel Comey Idolon Calf Hair Wooden Heel Clog in size 38. Great condition! Gently Pre-owned No Flaws or Defects. Women's CROCS BLK Size 9W Sarah Dual Comfort Clogs Slip On Buckle Strap Mules . Shipped with USPS Priority Mail. BORN Black leather clogs: Women's US 9 M/W. Leather wrapped heel. Leather wrapped 4" heel. Absolute mint condition. Worn once. Ugg Beige Nubuck Leather Clogs. Wooden platform and heel. High Fashion at Low Prices. Back to Top. Width: 3 1/8". Our idea of EXCELLENT CONDITION may differ from yours. We try to the best of our ability to describe the. 2" front platform 5.5" wood heel. New Without Box Size: 40 / 9. Condition Notes: Great Condition. Slight tear to insole right heel. Otherwise clean throughout and sole and upper Leather in great shape. Smoke Free. MICHAEL KORS Womens Brown Leather Clogs Mules with Tassles - Size 7M Super Cute and Well Crafted Heeled Clog Nice Stud Accents on Clog and Tassels These are in Terrific Shape with Padded Footbed No Returns - Sold As Is Fast Shipping SmokeFree/Pet Free Home Thanks for Looking! Proenza Schouler. Ki High Clog Open Toe. Black Suede Platform Heels. Label adhesive remnant on sole. We will respond as soon as possible. May have light imperfections from being out of box. White Pebbled Leather. Excellent Condition Colin Stuart High Heels. Chunky heel. Ankle Strap w/ Buckle. 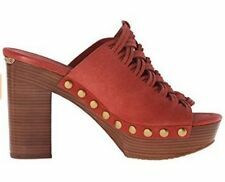 Born Women's Brown Leather Platform Clogs Size 9 - new with tags. Easy Spirit Womens Black Leather “Norris” Chunky Heel Clogs Sz 7 3” Heels Padded comfort soles Leather upper, rest manmade Worn once, Slight creasing right shoe and minor scuffs tips of shoes (SEE PHOTOS) PLEASE READ: Items from our store are from a smoke and pet-free facility. Items must be returned using same shipping method and be returned in same condition for a full refund. Items ship daily if ordered by 4 P.M. Thank you for your interest. Wonders Black Patent Leather Mary Jane Ankle Strap Clogs Sandals 37 6. - 7 $150. Designer: Wonders. Detail: adjustable buckle. Content: Leather upper, balance man-made materials. Condition: Barely worn! Super Excellent condition, worn once, very light heel wear. Width: 3 1/8". Clarks Artisan Black with Dark Maroone Tint Patent Block Heel Horsebit Loafer Size 9M. Good Condition. Light wear and few scuffs on each shoe. See photos. SHOOTIES, WESTERN CLOGS by NINE WEST. SLIP-ON STYLE / OPEN BACK CLOGS SOFT MAN-MADE SOLES. STYLE: HANNAH. LIGHTLY PEBBLED GENUINE LEATHER. HARD, WIDE, STACKED-STYLE Heels (WHICH RISE TO 3.5"). SHOOTIES, WESTERN CLOGS by NINE WEST. SLIP-ON STYLE / OPEN BACK CLOGS SOFT MAN-MADE SOLES. STYLE: HANNAH. LIGHTLY PEBBLED GENUINE LEATHER. CUSHION insole. HARD, WIDE, STACKED-STYLE Heels (WHICH RISE TO 3.25").